Manufactured from PVC plastic, vinyl fencing is completely weather proof. Compared to a traditional wood fence a vinyl fence is practically maintenance free. They are simple to install and environment friendly, as they can be wholly recycled back into the manufacturing stream. They also boast one of the longest average service lives in the fencing industry. Translated, this means a vinyl fence in Burke, VA will never need painting or staining, won’t split, splinter, or deteriorate, and is completely impervious to insects and rot. Vinyl fences are manufactured in panels. Some are untextured, but more are now available that mimic wood grain and stone. Color choices are expanding, but most vinyl fencing still comes in lighter shades. 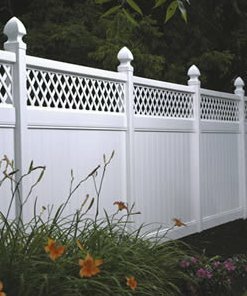 Vinyl fences come in a variety of styles, including privacy, picket, post and rail, and pool fencing. Vinyl manufacturers also make matching gates, pergolas, and arbors. Most importantly, when selecting a vinyl fence in Burke, VA, look carefully at the grade of plastic used in the manufacturing process. Higher grades of vinyl have higher concentrations of chemical stabilizers and other additives that combine to make a stronger, more durable, vinyl fence that resists damage from weather extremes and color fading. Big box stores often carry lower quality vinyl, so work with your fence contractor to select a vinyl product that will withstand the test of time. Although a vinyl fence in Burke, VA will cost more to install than wood, you save money over the life of your fence because you save in maintenance costs. A qualified fence contractor like Hal Co Fence can guide you through the vinyl fence selection process to ensure you make the right vinyl fence selection for your home. This entry was posted on Sunday, June 30th, 2013 at 7:14 pm	and is filed under Fences, vinyl fence. You can follow any responses to this entry through the RSS 2.0 feed. Both comments and pings are currently closed.